For a number of years I have tried to guide my friends, the preservation community, through the various problems and issues involved in restoring elderly EMD 567 series diesel engines for occasional operation. This article is a summary of what answers I have been able to find on issues of parts availability and the most common questions involving the viability of operating the various models of the 567 engine. Efforts to restore and operate ancient diesels are important and commendable, but trying to resurrect a diesel engine that is unsupportable can generate cost overruns that can easily sink a restoration project. This may seem strange at first, as we tend to take the EMD 567 series diesel prime movers for granted, there were so many of them produced and they were used in so many locomotive models. There is considerable parts interchangeability within the engine series, but there were also a steady flow of design improvements that made some of the components used in the older models obsolete. As the remaining population of early models of the engine has diminished, this has left some critical gaps in the parts availability. But the 567 series diesels were mass-produced, right? Electro-Motive and the aftermarket manufacturers must have built parts for these engines by the thousands! Yes that is true, but in recent years they have scrapped parts for obsolete diesels by the thousands too. With the high cost of warehousing and the inventory taxes in many states, diesel engine manufacturers cannot afford to keep infrequently selling parts for 60 year old engines on the shelf. It generally requires four or five sales turns on inventory a year to justify stocking an item nowadays. If you cannot obtain an item, what about reverse engineering it and building the part yourself? Before you go down this road you need to take a very critical look at where you are headed. Building parts locally for a diesel engine is not at all like building parts locally for a steam locomotive. Since nearly every order of steam locomotives was a custom job, the number of "standardized" components was rather small. An order of steam locomotives was usually delivered to the railroad with a supporting library of manufacturing drawings that would fill a wheelbarrow. The design of steam locomotive parts was based around the expected need to be able to do some limited local support rather than waiting weeks or months for the original manufacturer to cast, machine, and deliver a replacement part peculiar to just one class of locomotives on one railroad. Diesels were set up for mass production using very specialized machine tools designed for very specific manufacturing operations. These are usually not the conventional machine shop "general purpose" type tools, and when a part is discontinued the specialized tools and fixtures are usually not adaptable for other purposes and get scrapped soon afterwards. In addition, manufacturing many of the components for diesel engines requires great attention to material composition, casting procedures, heat treatment, and surface finish considerations. That type of metallurgical and machining support is very difficult to find nowadays in local shops for the extremely small production runs involved in restoration projects. Consequently with the earliest EMD 567 engines approaching 70 years old, we have reached the point where some of them are joining the Winton 201A in being economically "unsupportable". This article is an effort to explain what the potential problem areas are for each model of 567 engine, so that anyone planning to operate these machines will have a better idea what they are up against. One of the original EMD 8-cylinder 567 "U" deck engines is shown on test around 1937. Photo from the "Inside EMD" slide lecture program by Preston Cook. The 567 "U" (cast top deck) and 567 "V" (fabricated top deck) engines were the earliest production models in the series, spanning the period from 1938 to the middle of World War Two. Both engine models have rectangular hand hole covers. The "U" and "V" designations refer to the shape of the "valley" between the banks of cylinders, where the exhaust risers mount to the crankcase. They were built in 2, 6, 8, 12, and 16 cylinder models. 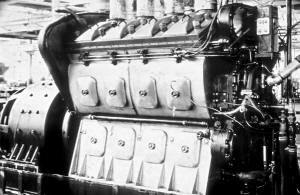 The two cylinder engines were used for component development and oil testing. The eight cylinder 567U and 567V engines are often overlooked as they were built for marine and stationary service, and many writers have researched EMD only from a standpoint of their locomotive production. 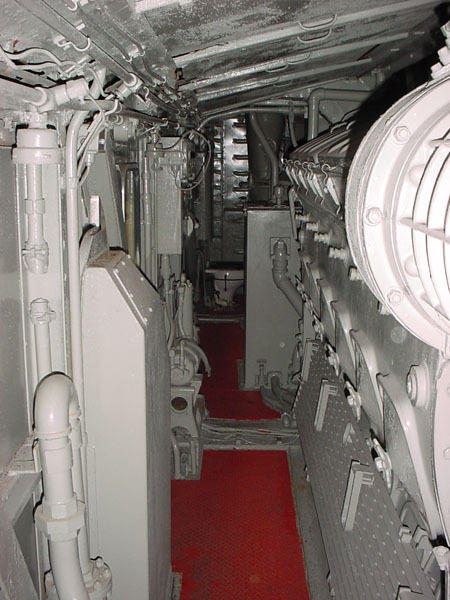 Most of the sixteen cylinder "U" deck engines that were built had problems with top deck cracks and were retired in a service changeout program by 1943-1944. The success of the FT freight locomotive catapulted Electro-Motive into the lead in the domestic diesel road locomotive market. 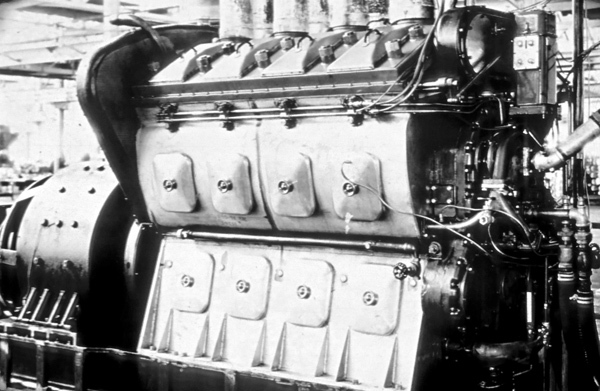 Early FT production started with the 567 "U" deck and "V" deck engines, while later production used the 567A engine. The demonstrator was returned to EMD in 1989 for the 50th Anniversary Open House, and received a cosmetic restoration as part of the project. EMD photo from the "What's In Those Covered Wagons?" slide lecture program. Used with permission. Both of these engine models present similar problems in planning a restoration. They both used timing gear train arrangements employing parts that have been out of production for many years. The 567 "U" deck uses an unusual camshaft bearing arrangement with lower shells only, these have no tangs, and have been out of production for several decades. Consequently even though some other parts are still available that can be used in these engines, any failure in the timing gear train is likely to render the engine permanently inoperable and unrepairable. There are additional issues pertaining to the cylinder "power assembly" components that are used in these crankcases. These issues are in common with 567A and 567B engines and will be covered in the section on those engine models. It should also be noted that crankshafts for the six cylinder versions of these engines (and all other 567 models) are very rare and difficult to obtain now, but on the other hand the six cylinder 567 engines seldom fail crankshafts. I tend to take the same viewpoint on operating a 567U and 567V engines that I do with a Winton 201A, which is that these engines are so rare now that the risk of damaging one by having a major mechanical failure makes it questionable whether you should risk operating it at all. They have reached the point where they have a higher value as a display than as an operating diesel engine. While it might be quite tempting to try to resurrect an otherwise serviceable locomotive that has one of these engines (particularly a nice switcher that could be very useful), is it worth the financial risk to do a bearing change and cylinder overhaul and then have the engine taken out a short time later by a gear train failure that cannot be repaired for lack of any parts? If operating the locomotive is the most important factor, perhaps installing a later model engine is the more practical approach, and put the 567U or 567V engine on display. I fully understand that a prime mover change is a very unpopular alternative with groups concerned with maintaining total authenticity of their equipment. Over the years I have occasionally received some sharp criticism when my advice to consider installing a later model engine was not what the people doing the project wanted to hear. Just be aware that trying to operate an elderly diesel engine without proper parts support has the potential to soak up enough money to build a brand new structure to house the equipment. The 16-cylinder 567B engine was used in the F2, F3, F7, GP7, and BL2 models. Many of these engines were subsequently upgraded to the 567BC variation. Photo from the "Inside EMD" slide lecture program by Preston Cook. The production of these engines spans the period from the middle of World War Two to 1953, and both were in production concurrently for many of those years. Both engine models have rectangular hand hole covers. The also have a water manifold built into the top deck that cools the exhaust risers coming out of the cylinder heat pots. This results in the exhaust manifold having flat (horizontal) mounting flanges, rather than the vertical (567U) or angled (567V) flanges of earlier engines. The cylinder layouts produced were the same as for the predecessor 567U and 567V engines. The major difference between the two is that the 567A was designed for separately mounted accessory equipment while the 567B uses an engine mounted strainer box to service the scavenging and main lube oil pumps. Due to the similarity of major components these two models can be addressed together, in terms of availability of parts and the problems they present for restoration to service. #2 engine in #5901 looking aft on the right side of the engine room. This engine has definitely received some modernization, as evidenced by the later design top deck covers (with hold down clamps). There is considerable interchangeability of parts within the various EMD 567 engine models. Photo from the "What's In Those Covered Wagons?" slide lecture program by Preston Cook (with thanks to the RR Museum of Pennsylvania). The most significant problem in trying to restore a 567A or 567B engine for operation is the diminishing availability of the original style water deck cylinder liners. 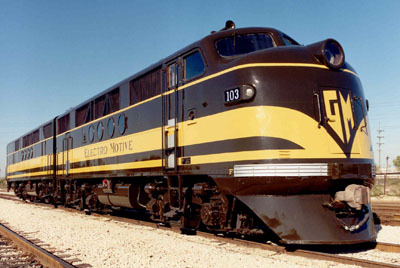 EMD dropped these from production in the late 1970s, several aftermarket suppliers produced them afterwards, but they are becoming increasingly difficult and expensive to obtain. The original style eyelet type connecting rods and the matching piston carrier and piston have been out of production at EMD for many years too, but 567C pistons, piston carriers, and trunion type rods can be used as a replacement. The 567A and 567B type cylinder heads were also discontinued, but one aftermarket supplier was offering a very innovative service to remanufacture 645 engine cylinder heads to fit the early 567 engines. 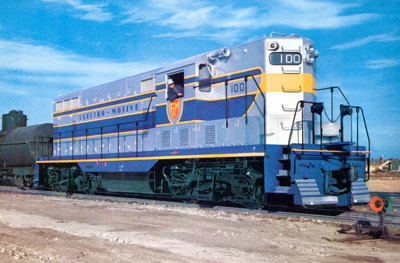 The highly successful GP7 roadswitcher was introduced in 1949, with more than 2600 units eventually being produced. The GP7 used the 16-567B rated at 1500 HP engine while the successor GP9 used the 16-567C rated at 1750 HP. EMD photo from the "EMD Demonstrators and Displays" slide lecture program. Used with permission. When operated infrequently these engines tend to have problems with water leaks around the cylinder liner and cylinder head seals. These leaks frequently result in water contamination of the lubricating oil, which can lead to subsequent bearing failures. The rust and corrosion resulting from the leaks often has damaged the crankcase sheets that the water seals fit against, requiring additional repairs. This was a significant problem in operation of these engine models by the railroads, and is even more of a problem in museum or excursion operations. 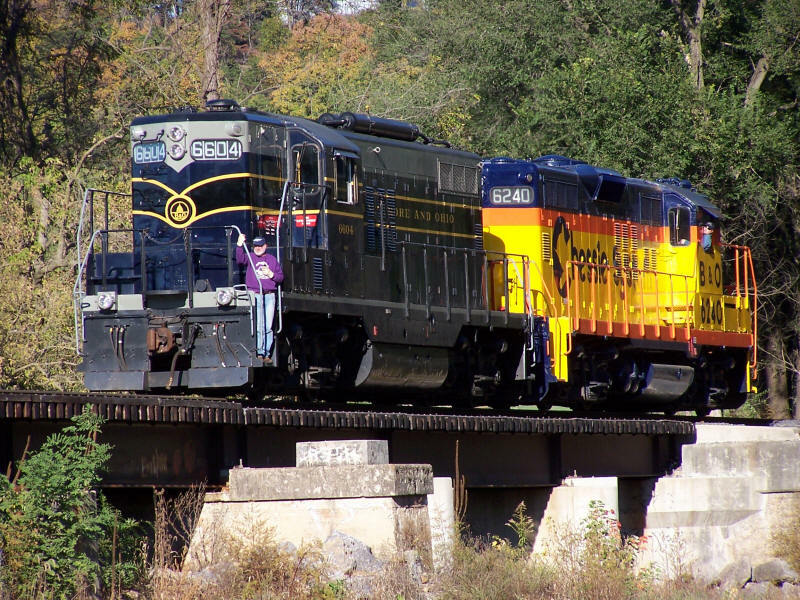 Former PRR E8As #5711 and #5809 bask in the autumn sun on October 3, 2004 at the Altoona Railroaders Museum for the annual Railfest event. 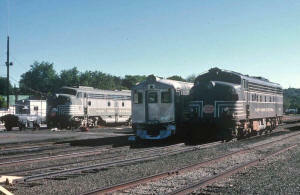 Both locomotives, now privately owned by Bennett Levin, were delivered to the PRR with 567B engines. Photo by Andrew Morris. 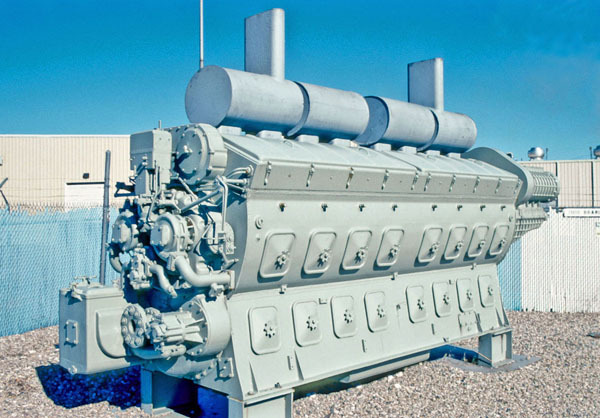 While the 567A and 567B can be operated successfully if you have an adequate supply of the proper cylinder liners and cylinder heads, the water leak problems and parts support are major concerns in the long run. 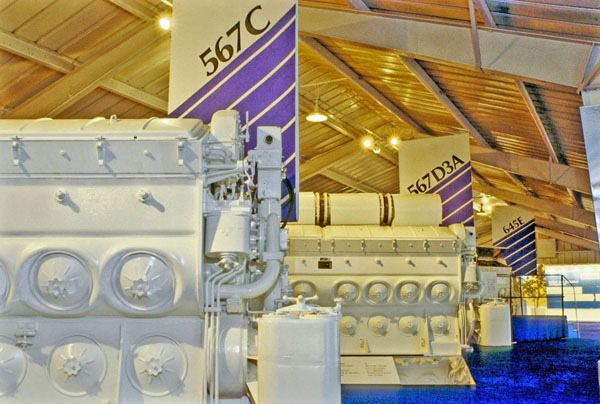 The 567AC and 567BC engines we will discuss next are much easier to support and since they are visually almost identical to the 567A and 567B, they may be a much more practical alternative in the long run. What could easily pass for a New York Central yard in the late 1950s is actually the Danbury Railroad Museum in Danbury, CT in October 2003. New York Central E-unit #4096 (far left) is joined by a former New Haven FL9 #2013 (right), masquerading in NYC lightning stripes. 4096 was built as Union Pacific E9A #912, then became Amtrak #417 before going to the railroad museum. Both 912 and 2013 originally had 567C engines. Photo by Justin Franz. The water leak problem resulted in many of the 567A and 567B engines being remanufactured into 567AC and 567BC engines. These engines have a modified crankcase with the water deck eliminated and have a 567C type water manifold and jumpers installed in its place. Of these two the 567BC is far more common, since the 567B engines were mostly used in road locomotives. The conversion has very little visual impact on the external appearance of the engine, the outside flange of the water manifold is barely visible on the engine. EMD originated the conversion, and parts for the 567BC are shown in EMD Parts Catalog 301. Most of the AC conversions were done during engine rebuilding, and no parts list is provided in Catalog 301. The modified AC and BC engines use 567C cylinder liners rather than the earlier style components. From a standpoint of restoration for limited operation of a locomotive originally built with a 567A or 567B engine, having a 567AC or 567BC engine installed is very highly desirable if one can be located that is in good condition. With some additional modifications the 567AC and 567BC engines can use 645 engine cylinder liners and reciprocating components. This requires changing the camshaft counterweights as the piston weight is different and has to be correctly counterbalanced. The horsepower rating of the engine is not increased as a result of this type of upgrade. If the engine is upgraded to use 645 power assembly parts, the limiting factor for continued operation of 567AC and 567BC engines in the future is the availability of the correct type of cylinder heads and the corresponding gasket kits. The EMD 567C, 567D3A, and 645 series engines are shown lined up at an open house in the 1980s. These engines are all very similar in outside appearance, and the 567 models are able to use many of the parts from the later 645 series. Photo from the "Inside EMD" slide lecture program by Preston Cook. The 567C introduced a completely new crankcase with round handhole covers, that eliminated the water deck feature of the earlier engines and used a water manifold in the air box with jumpers to distribute coolant to the cylinder liners. It was produced in 2, 6, 8, 12 and 16 cylinder versions. 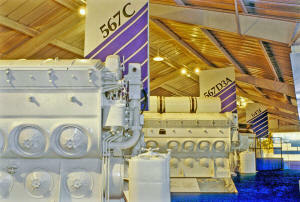 The 567C engines are very versatile and durable engines, and most of the service parts are still readily available. The most significant concern in the long run is that there will be diminishing availability and increasing price of 567C cylinder liners and pistons. It is possible to use 645 cylinder power assembly components in a 567C engine, this required changing the camshaft counterweights. The change must be done in complete engine sets or there will be significant vibration problems. If a 567C engine has been upgraded to 645 power assembly components, it is likely to be a viable engine to operate for many years into the future. The considerations for the 567D1 (roots blower) engine used in the GP18, GP28, SD18, SD28, RS1325, and late production FL9 locomotives are generally the same as for the 567C. GP9s Baltimore and Ohio #6604 and Chessie #6240 roll across a low trestle along the South Branch Valley Railroad during a railfan weekend in October 2005. The two GPs are used by the Potomac Eagle Excursion Train that operates on the state owned trackage between Green Spring and Petersburg, WV. Beside running excursions the line also runs freight trains powered by the South Branch Valley's roster of GP9s (including the pair seen here), and SD18s. Photo by Andrew Morris. The early turbocharged EMD 567 series engines present a significant economic hurdle for a museum or small operator, as the cost of rebuilding a turbocharger for a locomotive that will only see limited use is often very prohibitive. Even the least expensive "basic" teardown and reassembly of the 567 turbochargers goes in the range of $15,000 and a catastrophic failure can involve up to $40,000 in repairs. In addition the changeout is very time consuming and expensive. Many of the railroads could not justify this expense even when these older turbocharged EMDs were in regular service, and some removed the turbochargers and rebuilt the engines with roots blowers. The remaining fleet of 567D turbocharged engines in railroad service is very small now, in fact there may be more housed stationary generating units and tugboats with turbocharged 567 engines still active, than locomotives running 16-567D turbo engines. Consequently the price of overhauling a 567D turbocharger can be expected to increase substantially in the very near future. If you intend to operate a locomotive with a 567 turbocharged engine and need to change the turbocharger, it is very advisable to obtain some technical support from the EMD distributor. There are a number of system details of the 567 turbocharger that are different from the much more common 645 variety. The 567 turbos are particularly susceptible to damage due to lack of lubrication on startup and any time one is changed the soak back system must be carefully inspected and the engine thoroughly pre-lubed prior to starting. Failure to do so can result in critical engine damage or even injury to personnel. Proper pre-lubrication prior to starting is so critical on 567 turbocharged engines that it might be worth considering the permanent onboard installation of an engine (not just the turbo) pre-lube system to a unit that will be operated infrequently. The 567D series turbocharged engines can use 645 series cylinder power assemblies with appropriate changes to the camshaft counterweights as mentioned earlier. Many of the railroad that were operating these locomotives made this modification in order to standardize on 645 parts and cut their shelf inventory requirements. Most of the other parts for the 567 turbocharged engines are still available or suitable substitutions can be made with 645 components. Consequently it is should be viable to operate 567D series turbo engines for some time into the future, provided you can support the very hefty expense of maintaining a turbocharger. Oil control is a big concern on EMD engines that will be used only occasionally and may operate under very light loads. There is nothing worse for public relations than having stack emissions from your idling locomotive falling out of the sky all over the visitors automobiles in the parking lot. EMD 567 engines can use cylinder power assemblies with cast iron liners or chrome bore liners. In either case the appropriate piston ring set must be used (they are different materials) to avoid oil control problems and scuffing of the liner and rings. If you are planning on using chrome bore liners you should consult with other operators who have used them regarding oil consumption and oil control in light load operations. If a 567 engine has been modified to use 645 series cylinder power assembly components, then laser hardened cylinder liners become another option. Be aware that in addition to being more expensive, laser hardened liners tend to take longer to seat the rings and can run into oil control problems in extended light load operation. For most museum and limited excursion service applications, plain cast iron liners are the best choice. If you are changing power assemblies, be aware that 567C and 567D series engines have no built in siphons to drain the water manifold in the top deck when you dump the water in the engine. They require a special water outlet on the rear cylinder head in the right bank and the front cylinder head in the left bank. If you fail to install them in the proper location, and have to dump the coolant in freezing weather, you end up with the crankcase being irreparably damaged if the upper water manifold freezes. The fuel injectors for 567 series engines are generally still available as rebuilds, although the price of rebuilding may be higher if you are turning in some of the very old types of 567 injectors as cores. It an engine has been upgraded to use 645 series cylinder components, the fuel injectors are common and readily available. EMD no longer sells parts directly to museums or shortlines. Their designated distributor is Rail Systems Inc., which is located in Houma, Louisiana. They are also the source for all technical publications, including the EMD Pointers and Maintenance Instructions which cover a wide range of EMD service topics and parts history. Suitable parts for early model EMD engines are also available from a variety of aftermarket suppliers who advertise in the railroad trade press. Be aware that these suppliers are faced with similar production and inventory considerations as those that cause EMD to cease production of some items. Generally within a few years after EMD stops building an item, the aftermarket parts builders drop it too. I would suggest that before planning any project you carefully research the availability of parts for your particular engine, by talking with the folks at Rail Systems Inc. or your other suppliers. Obtain the available service manuals, scheduled maintenance instructions, and any applicable modification instructions before planning a job. And plan in advance to have a reasonable margin set aside to cover costs of possible additional repair work. When you tear down the engine you may find more things needing attention than were on your original list. Spare parts are another consideration. Many of the bearings, crankshafts, camshafts, pumps, and other auxiliary items applied to the later 567 series models are shared with variations of the 645 engines and consequently should be available for some time. The really critical items are the availability and cost of cylinder power assemblies and engine gear train components. If the locomotive will be critical to your operations, I would recommend having reasonably quick access to a set of cylinder power assemblies and a full set of connecting rod bearings, as one overheating event can cost you a lot of cylinder heads and maybe a few cylinder liners too. Having a set of spare injectors on hand is also a good idea, the presence of just a little water in the fuel can wipe a set of them out in one shot. It is often worthwhile to set up a lube oil monitoring system , it is a relatively inexpensive way to protect the time and money you have invested in a rebuilt engine. You might also consider sampling your fuel to detect algae or other contamination. I hope that this has provided some useful information. It is the same advice that I have given to a number of friends over the years, this time it is presented as an article instead. Some of this is admittedly a matter of judgment and, to use a common disclaimer, it is "offered without warranty or guarantee of any kind". I am just trying to make more of the preservation community aware of the potential problems they can encounter in operating these elderly diesel engines. I do not sell parts or do any consulting work, and I have no economic stake in any purchasing decisions your organizations might make. I have several dozen locomotives to take care of, and it is a full time job. So proceed with caution as an elderly diesel engine has the potential to burn up a lot more than just diesel fuel if you don&apos;t do a thorough job of planning and funding your repairs. Preston Cook has worked in the locomotive building industry for 35 years, serving in a variety of technical jobs for two locomotive manufacturers, and has done historic and technical presentations at museums and historical societies.